It is very strange to keep personnel after failing promotion twice, especially at lower ranks. Usually it only happens when people are fairly close to retirement. That the Marine Corps has taken this extraordinary step is a sign of how concerned the service is about its pilot inventory. It’s a tiny step that is barely a finger in the rapidly cracking dyke of Marine pilot retention. A squadron commander recently told me that the Marine Corps estimates it is short nearly 600 pilots. Considering that its total aviator strength is only 5,233, that’s a huge shortfall. Even though the Corps can’t keep its pilots flying as much as it would like, it still needs butts in the cockpits of deployed aircraft — one of the problems facing Marine aviation is that the pilots are being cycled into deployments more frequently that they otherwise would. Aviation units (and other other key billets) that are deploying get filled first. Only then do units that don’t deploy get taken care of. This means pilot shortfalls disproportionately affect aviation instructors. 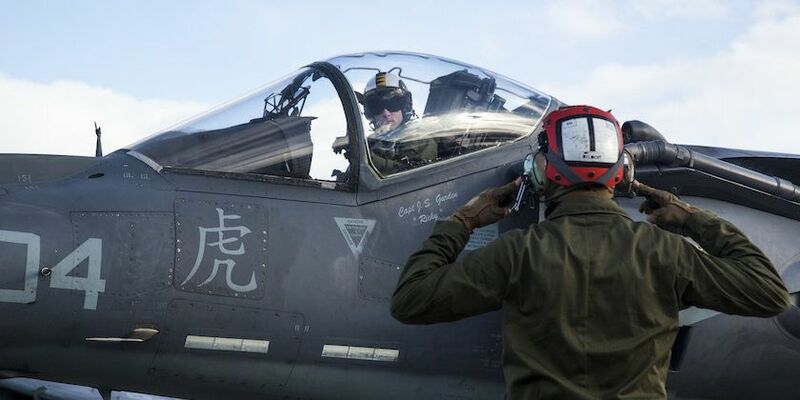 Typically, many pilots get become instructors for initial aviation training or in Fleet Replacement Squadrons after finishing a tour in the fleet. But since the Corps is short of pilots, especially captains, those training units are undermanned. But you need pilots to make pilots, and you can’t keep that up forever. Those instructors are the targets of this program. It’s a dirty little secret of Marine aviation that flight instructor jobs are often not career-enhancing. Instructors frequently get passed-over for promotion. That’s especially true for those teaching basic flying skills in orange-and-white aircraft in places like Pensacola, Corpus Christi, and Meridian. That’s okay by most of them, though. Many pilots went to those assignments hoping to get the flight hours they weren’t getting in the fleet so that they could more easily get hired for a civilian flying job. And that’s a serious flaw in the plan to retain them after passing them over. Why would they put up with three years being a second-class citizen, a twice passed-over captain, when most have a decent shot at an airline job? Besides, the population targeted by this MARADMIN is only about 90 pilots. Even if they all stayed, which is unlikely, it doesn’t come close to solving the problem. The Corps likely sees a few problems with buying itself out of this hole. It has a cultural issue to deal with that the Air Force does not. In the Air Force the pilots are the the stars of the show. They run the institution. It’s right there in the name. In the Marine Corps, pilots are just an oft-maligned piece of a larger puzzle, wherein the infantry is the most important piece. Infantry is the focus of effort. Aviation is support. Non-aviators have always had issues with the idea of pilots getting paid more. As the saying goes,”It’s not the flight pay I have a problem with. It’s the base pay.” Making pilots even more of an exalted class, pay wise, would be divisive in the egalitarian Marine Corps. Also, money spent on bonuses often goes towards those who would’ve stayed anyway. The military has studies detailing the inefficient nature of bonus payments going back to at least the early 80s. There’s also a grade-shaping issue — bonuses can lead to too many majors sticking around. The always rank-conscious Marine Corps doesn’t like upsetting its pyramidal rank structure. But that’s all moot for right now, because the current Marine Corps aviation bonus is zero dollars. In fact, until this year, many pilots accepted an incentive to get out through early retirement offers. The incentives overshot the mark, though, and now they’re short. A U.S. Marine Corps AV-8B Harrier with Marine Attack Squadron (VMA) 542 waits on the flight line before a routine inspection during the Aviation Training Relocation Program at Chitose Air Base, Japan, Dec. 7, 2016.U.S. Marine Corps photo by Cpl. James A. Guillory. The Corps can pay now or pay later. If it’s not going to put up the money in bonuses, it still has to pay some other way. Keeping passed over captains is one way of paying, but that’s one dollar against a twenty-dollar tab. The Corps has to look at other options more aggressively. The depth of the problem means the Corps needs to entertain some options that it’s thus far been unwilling to. As in battle, when things are at a critical point, you bring in the reserves. The Corps has used a limited number of reservists as instructor pilots for years. It needs to make reservists a much bigger part of the instructor base for both initial and fleet replacement training. Reserve duty is a great complement, timewise, to airline work. For those pilots who have to work their way up via lower-paying regionals, it will be seen as a good way to make up some income. Right now, there is no reserve squadron for Harriers, for example — some of those pilots would likely come back for the right reserve gig in a training command. There are other uses for reservists that the Corps hasn’t tried as much as it should, like integrating more of them into active duty units. Using reserve aviators as individual replacements in deploying aviation units could help take some of the load off active duty, for example. The Corps has to be careful not to slay the golden goose with this, but if it can’t beat the airlines, it might as well benefit a little from them. Of course, the biggest step the Corps should take is to not try to keep those who can’t make major, but rather to keep those who don’t want to. Some of them are good officers and pilots. And some of them don’t really want to fly straight-and-level for United at 35,000 feet, but they aren’t interested in the treadmill of staff jobs and schools that await them as majors or lieutenant colonels either. Offering qualified ones the opportunity to stay company-grade as limited duty officers, permanently working in aviation, would help with retention while not unduly screwing up the Corps’ grade-shaping the way second-term bonuses do. These ideas and others like them are going to be difficult. No matter what choices the Marine Corps makes, it will be dealing with the pilot retention issue for years to come, as airlines continue to expand. But right now it’s facing an intersection of poor quality-of-life, low flight time, and airline hiring that is proving disastrous. It has to use a combination of partial solutions to get through the immediate crisis while it rebuilds its aviation fleet. But the most important thing is let those who joined to fly, fly.